A 54 year old, alcoholic male presented to our hospital with recurrent episodes of hematemesis and melena since 2 days. On physical examination, he was found to have pallor and hepatomegaly. Laboratory investigations revealed elevated ALT (alanine amino-transferase 211 U/L) and elevated AST (aspartate amino-transferase 121 U/L) levels and elevated total and direct bilirubin (2.2 and 1 mg/dl, respectively). His serum total protein (5.4 g/dl) and albumin (3.3 g/dl) were mildly decreased, while serum globulin level was normal. All other parameters were within normal limits. Endoscopy showed denuded esophageal mucosa with hemorrhage and blackish discoloration. No varices were found. Aspergillosis was suspected. Multiple esophageal biopsies were taken and patient was asked to return for follow up after six weeks. 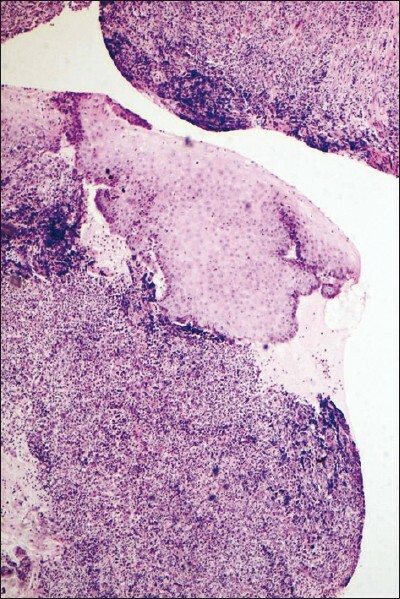 Microscopic examination of the esophageal biopsy specimens showed ulcerated mucosa and overlying granulation tissue [Figure 1]. Necrotic slough with candidal pseudohyphae were seen on the surface. Intranuclear Cytomegalovirus (CMV) inclusions were found in the endothelial cells, few incipient intracytoplasmic inclusions were also found [Figure 2]. A diagnosis of CMV esophagitis and candidiasis was made. However, a follow up esophagoscopy after 5 weeks showed normal appearing mucosa with fine nodular appearance in the mid esophagus with no evidence of denudation or ulceration of the mucosa. 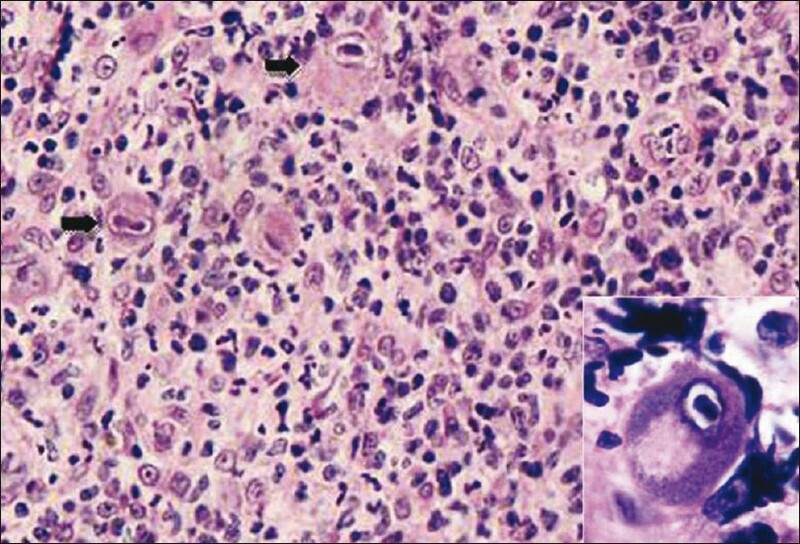 Repeat biopsy showed normal histology with no evidence of CMV inclusions or candida. Tests for Human Immunodeficiency Virus (HIV) 1 and 2 infections were performed after the histopathology report and were negative. Total Immunoglobulin G (IgG) levels' test and serology for CMV were not done as the patient could not afford the tests and the lesions' resolved without any treatment. In conclusion, diagnosing CMV infection in the GI tract calls for a high index of suspicion; especially, while dealing with small biopsy specimens from non-immunocompromised hosts. Possibility must be considered mainly in those cases where endoscopic examination has shown evidence of erosions and/or ulcers. Early diagnosis is crucial to enable prompt and effective antiviral treatment. 2. Szabo G. Consequences of alcohol consumption on host defence. Alcohol Alcohol 1999;34:830-41. 3. Featherstone RJ, LG Camero, R Khatib, Daniel S, Praveena M. Massive esophageal bleeding in Achalasia complicated by cytomegalovirus esophagitis. Ann Thorac Surg 1995;59:1021-2. 5. Goff JS. Infectious causes of esophagitis. Ann Rev Med 1988;39:163-9.